Food Basics Flyer Black Friday Sale 25 Nov 2018 contains amazing deals for their costumers. From kitchen to household, your choices are limitless at Food Basics. Do not worry, Black Friday deals are still on. Let’s visit a Food Basics store and make your shopping of month. These prices are very cool. If you are planning to go to shop, you must visit a Food Basics store. This market rayons contains a lot of deals together. Pick your favorite one and buy for almost half price. 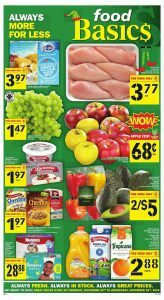 Food Basics Flyer Black Friday Sale 25 Nov 2018 is available for everyone. Black Friday deals contain special products. One of my favorite deals is Sun Chips. This one is my favorite thing ever I bought from Food Basics. Yayyy it is on sale again. Black Friday madness looking amazing. Whatever you need, available in this Food Basics flyer. Enjoy your shopping.